Books of Buderim, in the Sunshine Coast town of Buderim, has closed down after doing business for more than 50 years. The independent bookshop had been operating in Buderim since 1967, stocking a range of fiction, nonfiction and children’s books, as well as gifts and stationery. Blond said the store’s book-buying philosophy ‘was about providing a varied range so that all walks of life and all ages could find a treasure or two’. The shop ran a monthly book club, the Classics Bookclub, and supported many local causes including Gardens of Buderim Festival, Voices on the Coast and Anywhere Theatre Festival. 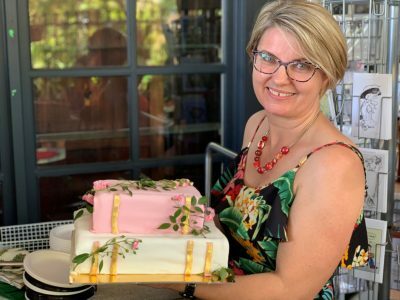 ‘Community interaction has been integral to Books of Buderim’s business,’ said Blond. Blond was also able to indulge her passion for events, with the shop hosting authors including Lynette Noni, Jessica Townsend and Peter Phelps, as well as many local authors. ‘They have offered the bookshop and me personally some of the most memorable discussions and presentations,’ said Blond. Books of Buderim traded up until 24 December 2018, after which a farewell gathering was held on the premises.